In this video we're showing you where to park in Gatlinburg, Tennessee! One of the questions we are constantly asked is where to park in Gatlinburg when coming to see Impossibilities. Even though the topic seems overwhelming, it's actually pretty simple. 7 may not seem like a lot but it is plenty! Everything on the strip in downtown Gatlinburg is in pretty close walking distance. So all you need to do is find one spot to park your car and then enjoy the rest of your day in Gatlinburg! Parking in Gatlinburg will cost around $5 to $10 depending on the time of year and where you parked. For most the lots, that price is for all day so if you're going to be in town for awhile it's pretty inexpensive. Oh, and make sure you bring cash for parking in Gatlinburg. Some of the lots (at the time of this writing) don't take credit or debit cards. So if you leave after the tenant goes home, you can actually get stuck in the parking lot. Trust me, this happened to me one night. And if you're coming to Gatlinburg to see Impossibilities at the Gatlinburg Space Needle, good news! Most of these 7 lots are walking distance from where we are. A lot of people also ask us if there is free parking in Gatlinburg. There is free parking on River Road but it fills up wicked quick. If you get into town really early there is a good chance you can get a spot on River Road for free but to be honest, it's probably easier to just park at one of the pay lots. If you don't want to do any driving at all there is also the Gatlinburg Trolly. The Trolly is a very inexpensive way to travel around town and there are at least two stops next to the Gatlinburg Space Needle (did we mention that's where Impossibilities plays?). Did you find this video helpful? Let us know in the comment section below. And if you want more videos like this one don't forget to subscribe and hit the bell icon! The Master Mentalist Erik Dobell performs "Sleight of Mouth" during Impossibilities in Gatlinburg, Tennessee. 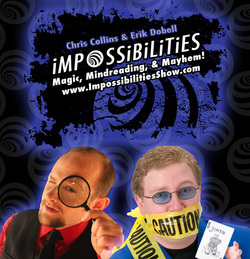 The Master Mentalist Erik Dobell performs his Magic Word routine during Impossibilities in Gatlinburg, Tennessee.